Welcome into Residence 8E, a sleek one-of-a-kind home conveniently located in the heart of lovely Lenox Hill! 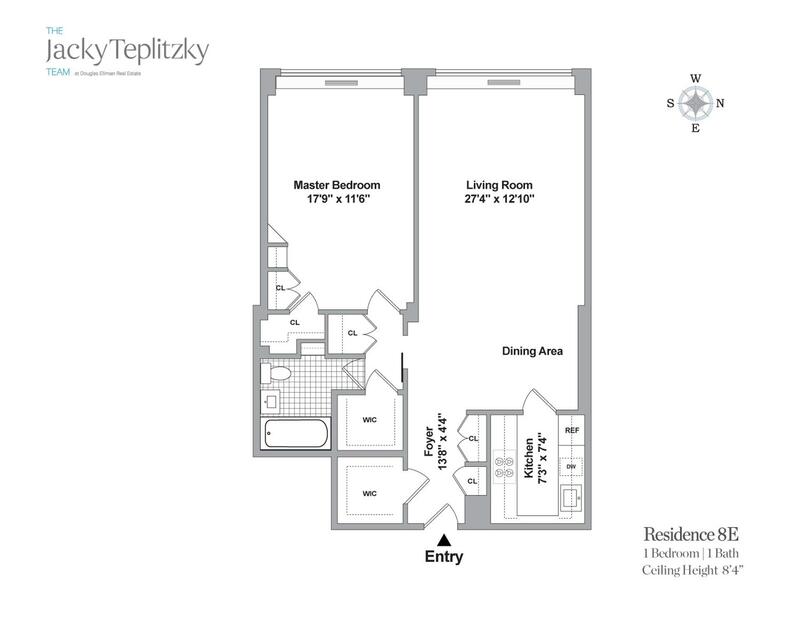 As you enter into this oversized 1 Bedroom 1 Bath home, immediately you'll realize it's a cut-above the rest. A traditional post-war one bedroom layout has been reimagined and thoughtfully updated to include built-in's throughout to maximize storage and create a layout in which nearly every inch of square footage is usable. In the entry foyer you have three closets one of which is large enough to be repurposed into a home office. The living & dining area offer great light all day long and the spaces have been perfectly apportioned to create two areas out of one, further evoking the feeling of being in a larger home. The kitchen is cozy and features cherry wood cabinetry, granite counters, stainless steel appliances and can easily be converted to an open concept kitchen if preferred. The master bedroom suite also has oversized windows that offer city views and there are more closets than you will need. The en-suite custom bathroom includes tumbled tiles in neutral tones and stone flooring. Additional conveniences include wood floors, recessed lighting, city-quite windows, central AC/Heat and washer/dryer installations are permitted with board approval. Bulk rate electric is added to maintenance. Pied-a-terre's and pets permitted. Built in 1963, 205 East 63rd Street is a full-service post-war coop comprised of 128 apartments on 20 stories. This attractive beige-brick building has a full-time doorman, live-in super, laundry room, storage and parking garage with reduced rates for residents. Residents are a stone's throw to everything to be desired in a NYC lifestyle: jog at Central Park, workout at the 63rd Street Equinox or take a class at Soul Cycle. Whole Foods and Morton Williams nearby are great for grocery shopping and if you prefer to enjoy a meal out go to East Pole, The Regency Bar & Grill or Upper East Café among other great restaurants in the neighborhood. For transportation, the F/Q subway entrance is conveniently located immediately outside the building and the 4,5,6 are accessible nearby at 59th & Lex. Don't wait, call to schedule your private showing today!